Summer is here and boating season has begun! The sun is shining, the boats are sailing, and the BBQ’s are grilling! With Memorial Day right around the corner, this is the perfect time to purchase a vacation home that will accommodate your boat or future boat. Pool homes are very popular during the hot months of summer in Lake Havasu making it easy to take a quick refreshing dip in your own cool pool. 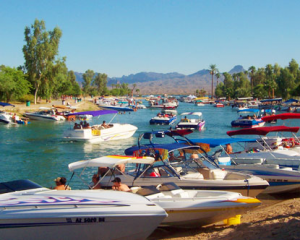 However, a 7 minute drive will have your toes in the waters of Lake Havasu! No properties on the water except for some Town homes which run between $400,000 to 1.4 Million. Some have beach access. Most homes have some view of the lake, Lake Havasu slopes up at a 4% grade from the lake. There are no direct flights into Lake Havasu at this time. The easiest way to get here is to fly into Las Vegas rent a car and drive here 2.5 hours. We are 2.5 hours from Las Vegas, 3.5 Hours from Phoenix and 4.5 hours from Los Angeles. Our population is about 50,000 winter goes up to about 75,000. Lake is beautiful about 26 miles long. Property taxes are based on the assessed value by the tax assessor NOT the selling price. Properties are assessed every year. You can protest the assessed value if you wish. Typical taxes on a Single family home in the $200,000 range is $1,200 – $1,400 per year. Most homes are now on City sewer system. Natural gas is kind of rare, most natural gas is typically in areas of commercial or multi-family, golf course does HAVE natural gas. We get 2” of rain per year. Beautiful 8 to 9 months out of the year, no bugs, hardly any wind, sunshine every day.